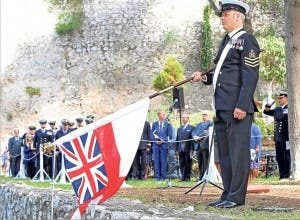 THE 210th anniversary of the Battle of Trafalgar has been commemorated with a Remembrance ceremony at the Trafalgar Cemetery. Members of the Royal Navy were joined by Chief Minister Fabian Picardo, acting Governor Alison Macmillan and Commander of the British Forces in Gibraltar, Commodore Iain McGee on October 18. The occasion also marked the 50th anniversary of the decommissioning of HMS Calpe, a Gibraltar-based Royal Navy Reserve Unit. To further mark the anniversary, there will be a HMS Calpe Exhibition in the Small Arts Gallery beginning on November 16. EACH year on the Sunday closest to the battle of Trafalgar (October 21), the Royal Navy holds a ceremony at Trafalgar Cemetery. But just two victims of 1805’s almighty battle between the Royal Navy and combined French and Spanish fleets are actually buried there. Instead, many tombstones commemorate those who died in three devastating yellow fever epidemics around the same time. While most of those that died at Trafalgar were buried at sea, Lord Nelson’s body was transported back to London for a state funeral and burial at St Paul’s cathedral. However, he was initially taken to Gibraltar’s Rosia Bay, in his ship HMS Victory, where his body was put in a vat of rum to conserve it, before being sent to the UK.